OG + Famous Celebrities - Healthy Coffee & Tea Business! OG Scores A Knockout Victory With Manny Pacquiao Announcement Organo Gold is happy to announce an exciting new relationship with one of the greatest fighters in the history of professional boxing, Manny Pacquiao! The 10-time world champion and Number One Lifestyle have joined forces to form one of the most powerful and exciting collaborations in Network Marketing. While he is known globally for his work in the ring, it’s his generosity and grassroots work in the Filipino community that has made the biggest impact on his homeland. As an Ambassador for Habitat for Humanity, Pacquiao has paved the way for several humanitarian projects not only in Sarangani, but also in other depressed areas of the Philippines. With 38 career knockouts in the boxing ring, it’s his ambitious goal of knocking out poverty that may prove to be the most important fight of his career. The Pac-Man, as he’s affectionately known, was recognized as The Fighter of the Decade from 2000-2010 and is the first and only boxer in history to win a world championship in 8 different weight classes. With a career record of 55 wins and 38 knockouts, it goes without saying that OG is very excited to be fighting alongside one of boxing’s most celebrated competitors. On behalf of the entire OG Family, we’d like to welcome Manny Pacquiao to Organo Gold! Labeled "The Great White Shark," Greg Norman spent 331 weeks as the world's No. 1 ranked golfer throughout the 1980s and 1990s. Norman has won 91 professional events around the world and serves as Chairman and CEO of Great White Shark Enterprises. Organo Gold, the gourmet coffee company that caters to consumers’ active lifestyles, proudly announced today it has entered into a global partnership with Greg Norman and his group company, Great White Shark Enterprises. Under the agreement, Mr. Norman will serve as a global spokesperson for Organo Gold. Mr. Norman first became involved with Organo Gold as a Distributor, which provided the foundation that led to Norman’s further involvement with the company. 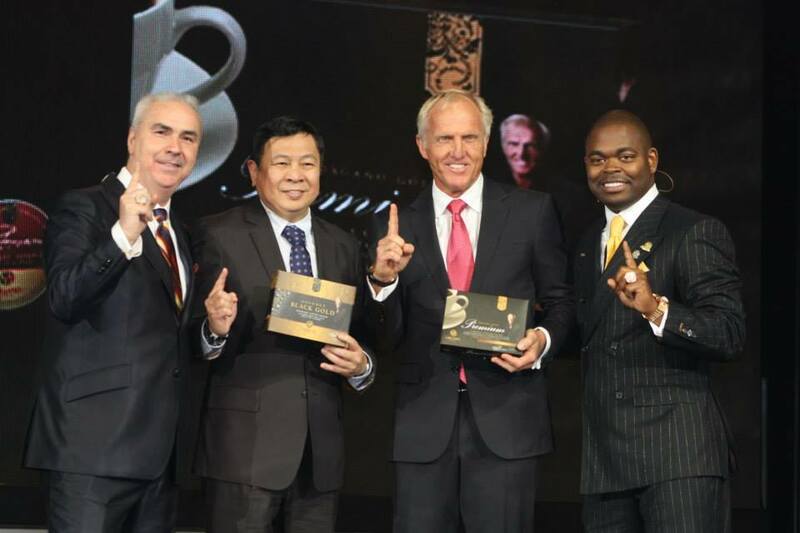 As global spokesperson, Norman will endorse Organo Gold’s expanding distribution network and portfolio of products.